The unfilled form of Viklang Pension Scheme laid brazenly among other documents at Gajro Devi’s house until it came to the notice of our Soochna Sevak, Rakesh, during his visit to her house. When Rakesh visited Supura to spread awareness about government schemes and policies, he visited Gajro Devi’s house. He was moved immensely by seeing her terrible condition. Gajro Devi is a 70- year-old widow and lives in Surpura village which comes under Dandi Sakhla Panchayat and is 13 kms away from Kalyanpur. 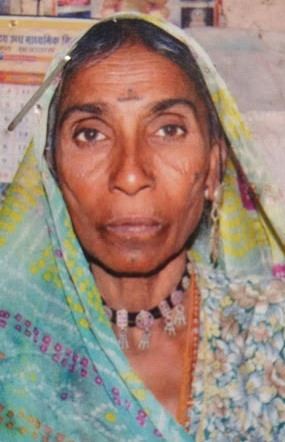 She has suffered a lot ever since the death of her husband Vastaram Bhil, who passed away 20 years earlier. Her only son is also physically disabled. The absence of permanent source of income has made her deprived too. Rakesh listened to her miseries patiently and then inquired about the ‘Certificate of Disability’ and also ‘Identification proof’ of her son. Gajro Devi handed him a pile of documents that has gathered dust on them. It was during this examination when Rajesh came across the form of Viklang Pension Scheme which was filled but never submitted. Rakesh explained her that unless she deposits this form, she will not be able to avail the benefits of a scheme. After two days, Soochna Seva conducted a big meeting at Dandi Sankla, where people from seven villages participated. Gajro Devi also attended this meeting and there she applied for the scheme. Within a month the form was processed but it was rejected due to the non-validity of certificate for disability. Gajro Devi visited Soochna Seva Kendra and asked for help from the team to get the certificate updated. The team got the document validated through medical examining officer . Gajro Devi applied for the scheme once again and is awaiting for the scheme to get approved. This time she is sure that nothing can go wrong and her son will get the benefits of Viklang Pension Scheme.